Found in FNA Volume 8. Treatment on page 399. Mentioned on page 398, 400. Shrubs or trees, 4–10(–20) m; bark dark red, smooth, until mid season when outer bark exfoliates, inner bark green, soon weathering to dark red; following exfoliation on younger wood, bark retained on oldest portions of main axis and on abaxial sides of larger lateral axes, area of retained bark gradually increasing as tree ages, becoming roughened dark gray. Leaves larger on sterile shoots with longer internodes; petiole 2–4.5 cm, base slightly decurrent, glabrous, sometimes with hairs adaxially; blade glaucous-green abaxially, olive-green adaxially (leaves of previous season turning yellow and red in June and July before they fall), elliptic, 6.5–13 × 3.5–6(–8) cm, base usually rounded, sometimes slightly cordate, rarely tapered, apex usually rounded or acute, rarely with short cusp, surfaces glabrescent (sparingly hairy on newly emerging leaves). Inflorescences (often compound), congested or not; axes hairy ± throughout, hairs not glandular. Pedicels accrescent, initially pendulous, becoming stiffly erect, 3–5(–6.2) mm, (to 6–8 mm in fruit), sometimes sparsely glandular-hairy; bract clasping base, rust-colored, scalelike, 2–3.5 mm. Flowers: calyx creamy tan at anthesis, lobes 1–2.1 mm, apex blunt; corolla 4.9–5.8 mm; anthers 1–1.2 mm, spurs usually slightly exceeding length of thecae; ovary with 2–5 ovules per locule. Berries red or orange-red, 13–20 mm diam. Seeds 2–2.5 mm. Phenology: Flowering Mar–May(-Jun); fruiting (Jun-)Jul–Sep (-Oct) (fruit sometimes held on the trees into early part of following year). 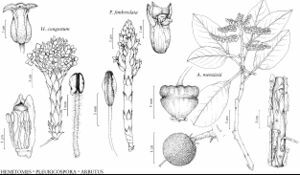 References to the presence of Arbutus menziesii in the San Pedro Martír Mountains of northern Baja California have not been supported by vouchers. Its southernmost area of occurrence is in San Diego County, California, where it is rare. Its range extends northward along the coast to British Columbia (about 50° north latitude, in the vicinity of Seymour Narrows). The smooth, red bark and its mid-season exfoliation mark Arbutus menziesii as a distinct species and one much sought as an attractive landscape tree. People who have acquired property with native individuals of the species already present are very lucky because transplants of young saplings for landscaping seldom succeed. Cultivation from seed seems to be successful.